Before thinking about our Sun the family of planets, moons Asteroids, Comets and Meteors we must go back long before the Sun was formed to when the Universe began. The almost universally accepted theory of how the universe was formed is the Big Bang Theory. This states that every thing we can see and even time itself came into being about 15 billion (15 million million) years ago in an enormous bang. After about a million years atoms had formed from the fireball of the Big Bang and light was able to shine. Nearly all matter at that time was in the form of the basic element Hydrogen. From huge swirls of Hydrogen gas, galaxies and stars began to form. It is believed that these early stars were very large compared to the stars we see today because they were formed of almost pure Hydrogen and could disperse their energy into space quicker and easier. Some of these old stars are thought to have been up to 300 times as massive as our Sun. Very few stars today achieve a size of more than 50 times the Sun. These huge stars consumed hydrogen at an enormous rate, converting it into heavier elements. Being so large these stars could only survive for a short time (probably less than a million years) then they destroyed themselves in colossal explosions. All the elements formed in these stars were blasted off into space along with the remaining Hydrogen. Great shock waves blasted across space from these unbelievable explosions. The shock waves pushed the gas and dust from other exploding stars into clumps which formed into new stars but these stars were not pure Hydrogen they were contaminated with Helium, Carbon, Oxygen, Calcium, Iron and even Gold all the elements we see around us today. About 4500 million years ago the blast from an exploding star formed a swirling mass of gas and dust into a spinning disc. At the centre the gas became so compressed and hot that a nuclear fusion furnace ignited and our Sun was born. At first the Sun was much more powerful and violent than it is today. It probably had huge jets of material blasting out of its poles and the radiation created a powerful solar wind. The solar wind blasted away all the light volatile material from the area of the disc closest to the Sun leaving only the heavier materials. The heavier dust particles drifted together to form larger and larger lumps until planet sized lumps had grown. The lighter gases were pushed to the outer parts of the disc where it was cooler and they froze into various kinds of ices which in turn coalesced into the gas giants. These gas giant were so big that the compression caused them to produce internal heat and the ices again became gas. It is thought that there may have been many more planets in the beginning but there would have been many collisions and near misses. Some planets may have been destroyed and the debris reformed into new planets or may have been absorbed by other planets which grew bigger. Close encounters could move planets out of there orbits and driven some to their death in the Sun. Others may have been thrown out of the Sun’s family to wander through empty space forever. Eventually all calmed down and the planets cooled and the Sun became the quiet stable star we see today. Now lets have a look at the family of our Sun but first we must look at the Sun, the dominating matriarch of the family. The Sun is about a million kilometres in diameter and contains nearly all the material of the solar system. The centre of the Sun has a temperature of millions of degrees centigrade and the surface has a temperature of about 6400 degrees centigrade. Virtually all the light and heat in the solar system comes from the Sun , without that light and heat even the atmospheres of the planets would be frozen solid. The Main members of the Solar Family are the planets and their moons there a 9 planets and most of these have moons. Below is a list of the planets and their main moons. The planets orbit as two main groups with Pluto being a bit of an oddity. The inner four planets Mercury, Venus, Earth and Mars are small rocky world whereas the outer four Jupiter, Saturn, Uranus and Neptune are gaseous giants. MERCURY is the nearest planet to the Sun and is the smallest of all the planets at 3030 miles in diameter, only half as big again as the Earths Moon. In fact both Jupiter and Saturn have moons larger than Mercury. The surface of Mercury is cratered and looks very moon like. 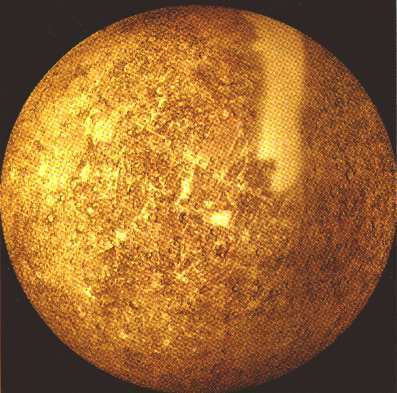 One face of Mercury always faces the Sun and therefore roasts in a blistering heat of 400ºC but the other side facing away from the Sun freezes at a temperature of only -170ºC. As it is so close to the Sun it is always quite difficult to see. This is because the sky is always bright and because mercury always rises just before the Sun or sets just after it is always close to the horizon. When it is seen in a telescope it often has a crescent shape like the Moon. Mercury has no known moons. 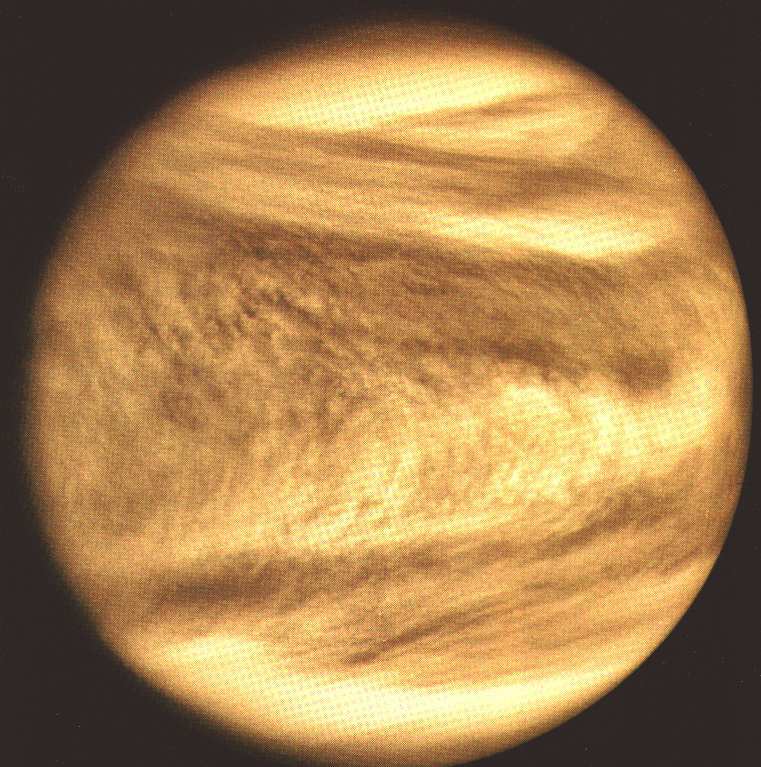 VENUS is almost Earth’s twin being the same size but is definitely not an identical twin. With a thick atmosphere of Carbon Dioxide Venus is suffering a runaway greenhouse effect. The surface temperature is almost hot enough to melt Lead at a 470ºC. Earth has as much carbon dioxide as Venus so it begs the question , why is Venus so different ? The answer is most of the Carbon dioxide on Earth has been absorbed by the oceans and then deposited as rocks such as Limestone. Most of the Carbon dioxide on Venus is still in the atmosphere. Ordinary telescopes even if carried on probes orbiting Venus cannot see any more than the top of the thick white cloud covering the whole surface. Radar has been used to penetrate the clouds and has recorded huge mountains and valleys. Venus has few recognisable craters because only the largest of meteors can penetrate the thick atmosphere and the craters which are formed are soon eroded by the harsh atmospheric conditions. Most have been eroded by powerful acid rain. Venus has no moons. EARTH is the third planet from the Sun and the only planet known, known to support life. One of the major ingredients required for life in all the form we know about is liquid water. 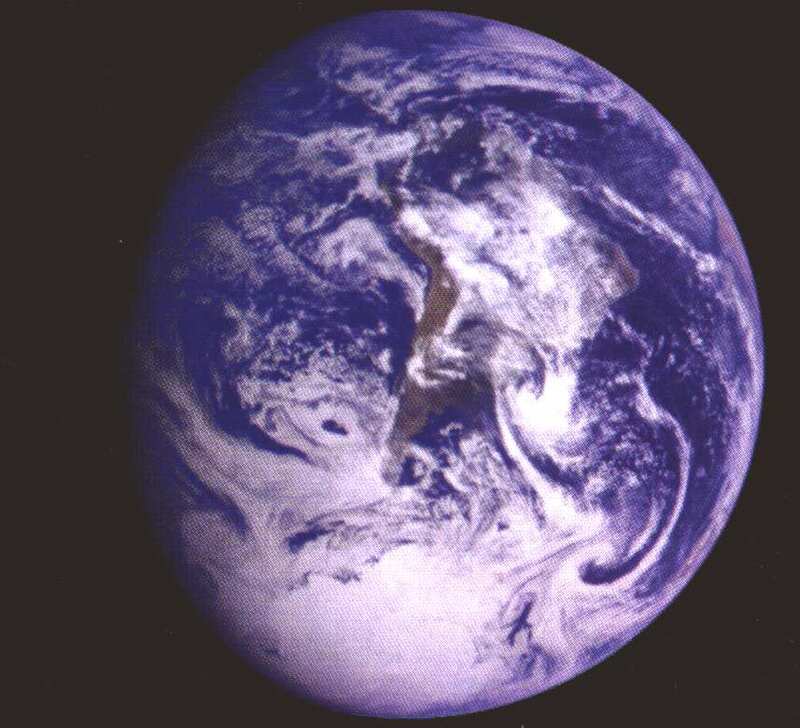 Earth is right at the centre of a zone which is known as the Goldielocks Zone, where the temperature is not too hot, and not too cold but is ‘just right’ for water to exist as a liquid. It is becoming more evident that the presence of our large moon may have played an important roll in the origins of life on Earth by producing the strong tides. Earth like Venus has few craters these have been eroded by weather and land movements caused by continental drift and plate tectonics. It is now thought that our moon was formed when a large planet sized object struck the Earth with a glancing blow in the early stages of it formation. The debris circled the Earth and eventually formed into the moon we see today. MARS is the outer member of the inner rocky planets. 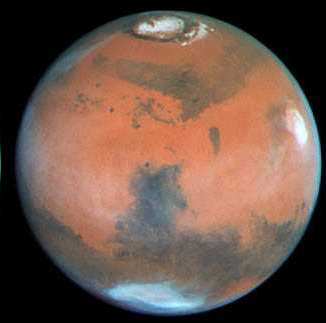 Mars has only a very thin atmosphere and no liquid water. Because it is on the very edge of the ‘Goldielocks Zone’ it is probably just too cold for liquid water on its surface. Another problem here is that the planet is quite small and doesn’t have a strong enough gravity to hold on to a thicker atmosphere. Without a thick atmosphere water boils instantly into a vapour and can then be lost into space. There are gigantic extinct volcanoes on the surface of Mars some up to five time the height of Mount Everest, Earth’s highest mountain. It is thought by many scientists that Mars had and atmosphere and even oceans, early after its formation but it was lost into space about 3 billion years ago. Mars has two small moons which may be captured asteroids (see below). ASTEROIDS are chunks of rock, ice and metals which orbit the Sun between the small rocky inner planets and the gaseous outer giants. In the space between Mars and Jupiter are hundreds of thousands of small planets known as Planetoids or Asteroids. It is likely that this belt of asteroids is material which might have formed into a planet but was prevented from doing so my the immense gravity of Jupiter which kept pulling them apart as soon as the tried to aggregate into a new planet. Asteroids vary in size from a few meters across up to the largest which may be hundreds of kilometres. Some meteors originate from asteroids when they collide and knock chunks off each other. These chunks of rock and metal fly off in all directions and a few head towards Earth and enter the atmosphere as meteors. 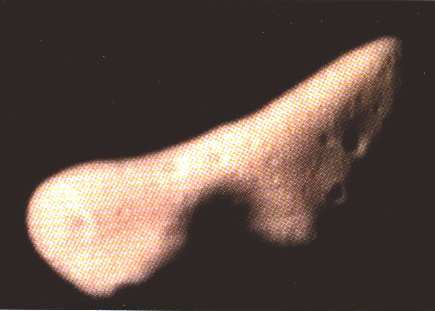 Some larger ones may even make it to the surface and cause craters. 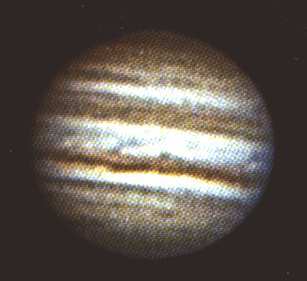 JUPITER is the largest of all the planets and is over ten times the diameter of Earth. Unlike the inner planets Jupiter has no solid surface because it is comprised of gas although it may have a small rocky or metallic core. Because Jupiter is so large the enormous pressure in the centre produces a lot of heat. This heat is conducted outwards through the gas and drives huge storms in the outer atmosphere. The surface of the planet has many coloured bands or ‘belts’ of different colours. These belts are mainly different shades of browns with variations fro white through orange to chocolate brown. There are even vivid reds especially in the famous giant Red Spot. The Red Spot is a massive storm larger than the size of the Earth which has been raging since before the invention of telescopes. Jupiter has many moons and more are being discovered all the time. Many are small and may be captured asteroids but four are large enough to have been planets, two, Ganymede and Callisto are bigger than Mercury. With space probes much more is now known about the moons especially the four Galilean moons (named after Galileo who discovered them). Io the inner, is the most active volcanic place in the Solar System. It is so close to Jupiter that is nearly torn apart by the gravitational forces. Europa is covered in ice and may have a liquid salty ocean beneath. Ganymede is the largest moon in the solar system (3270 miles in diameter). There are large areas on the surface cover with thick dark dust. The strangest features are the massive fault lines cause by movements on the surface. Callisto has one of the most heavily cratered surfaces in the Solar System. 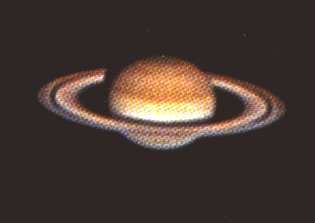 SATURN is the second largest planet but its most famous feature is the magnificent ring system. The ring or to be more precise rings are 275000km (170000 miles) across but only a few hundred meters thick. They are made up of millions of small pieces of ice and rock varying in size from a few millimetres to a few meters across. The rings are thought to be the remains of a comet or a small moon which was pulled apart by Saturn’s gravity. In theory the rings should not last for very long but they appear to have been around for a very long time. Small moonlets have been found orbiting within the rings which appear to stop the rings falling apart. As these small moons orbit their gravitational influence pushes and pulls the ring particles into place, these moons are therefore called ‘Shepherd Moons’. There is a gap in the rings called the Cassini Division, this can be seen quite clearly in medium sizes telescopes. When space probes photographed the ring close up it was found that there are in fact hundreds of rings and divisions. Saturn, like Jupiter has dozens of moons with some large and some small. Titan is the largest moon at 3500 miles in diameter and is one of the most intriguing of all the moons in the solar system. It has a thick atmosphere and may have oceans, land, clouds and rain not of water but all made of Methane. A space probe called Cassini is due to land on Titan in 2004. The probe has a camera on board and will film the decent of the craft through the atmosphere by parachute. Saturn has many other moons of various sizes. Titan can be seen in most telescopes and perhaps three more may be seen in a 6 inch telescope. Larger amateur telescopes may pick out up to seven. 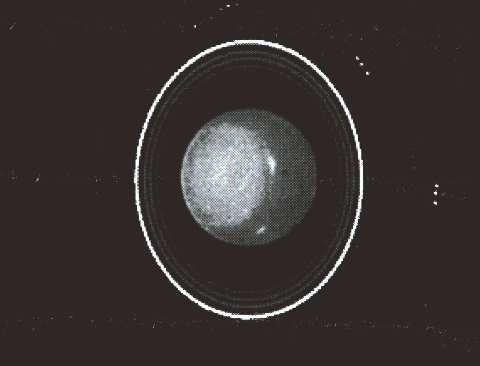 URANUS is quite hard to find in smaller telescopes but when found displays a small greenish disc in a 6 inch telescope. It is the first of the planets to be discovered using a telescope because it is not visible to the naked eye. Uranus is a gas giant but smaller than Jupiter and Saturn it is also much further away from the Sun. There is a very odd characteristic, that is the poles of Uranus are tilted at 90º to its orbit plane. This means that for half its orbit one pole points towards the Sun and for the other half the other pole point to the Sun. In other word the summer and winters last for 42 Earth years each but each day is only about 11 Earth days long. There are not many features visible in the atmosphere but Uranus like all the gas giants does have a ring system, it is however very faint. Neptune has five fairly small moons. NEPTUNE is the last of the Gas Giants and is approximately the same size as Uranus and also appears blue / green. Because it is even further away than Uranus it is even harder to find. Strangely the atmosphere on Neptune is much more turbulent than on Uranus. This is because Neptune produces much more heat in its core although the process is not yet fully understood. Neptune boasts the largest moon is the Solar System in Triton which has a diameter of 3300 miles and can be visible in medium sized telescopes. PLUTO is considered, by some people, not to be a true planet but just the largest of the icy bodies orbiting the Sun beyond Neptune. With it relatively large moon Charon, it can almost be considered to be a double planet. At 4000 miles in diameter Pluto is about the same size as Mars. Although classed as the outermost planet, it has an odd orbit which sometimes takes it inside the orbit of Neptune but most of the time it is the most distant planet. Pluto is so remote that the Sun looks more like a very bright star than the Sun we know. The surface is so cold that all the gases there are frozen solid. COMETS are like giant dirty snowballs which originate in a vast area of space beyond the orbit of Pluto and may be the left over remnants form the formation of the Solar System. The vary in size but are on average about 25 miles across. For some reason one may get disturbed from its orbit a head in towards the Sun. As this huge ball of frozen gas and water mixed with dust moves closer to the Sun it begins to melt. The gases and water vapour are pushed away from the comet by the strong radiation from the Sun and the solar wind. The gas is pushed away from the Sun and forms the familiar tail see on some comets. The dust particles also form a trail in front and behind the nucleus. If the Earth passes through this trail of particles the particles enter the atmosphere they burn up and cause a glowing trail which we know as a Meteor. Some comets fall straight into the Sun others loop around the Sun and return to the outer solar system sometimes to return years later.